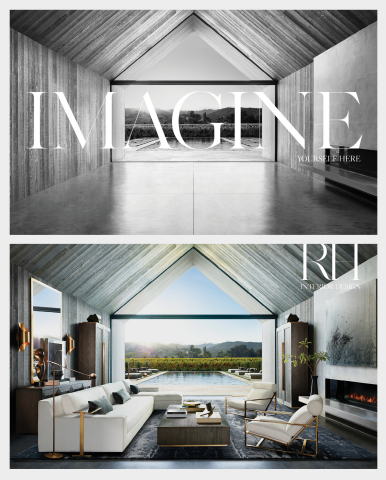 CORTE MADERA, Calif.--(BUSINESS WIRE)--Nov. 7, 2016-- RH (Restoration Hardware Holdings, Inc. – NYSE: RH) announced today the introduction of its fully integrated design platform with the launch of RH Interior Design, a concierge-level program that inspires customers to imagine the infinite potential of a blank canvas and make their dream space a reality. To support this enhanced offering, RH will also unveil interactive RH Design Ateliers across its entire retail fleet this fall, including more than 50 markets throughout the United States and Canada. RH Interior Design places clients at the center of the creative process, working to realize the full potential of their home and bring their vision to life. Trained in the RH design ethos and educated in architecture, interior design and the arts, the RH Design Team helps clients reimagine and reinvent one room or an entire home, inside and out, to give them the home they hope to create. From striking landscape design to fine Italian bed linens, the brand’s entire product assortment is leveraged – allowing for the creation of harmonious spaces that reflect an intentional approach to designing the whole space, rather than decorating with a mix of individual pieces. To support this unprecedented level of design services, visitors arriving to RH galleries will discover newly installed RH Design Ateliers beginning this fall – offering integrated workspaces inspired by the world’s best architecture and design studios. Here, guests can work with the RH Interior Design team or their personal architects and interior designers. A place for collaboration and ideation, RH Design Ateliers feature access to RH’s vast library of fabrics, leathers and furniture and lighting finishes. Also featured will be Ben Soleimani rug showrooms highlighting the fourth-generation designer’s hand-knotted and hand-woven rugs, as well as specialized displays for window treatments, bed and bath linens and bath hardware. For an appointment or more information, visit the RH Design Atelier at your local gallery or visit RH.com/InteriorDesign. This release contains forward-looking statements within the meaning of the federal securities laws, including statements related to the introduction of RH Design Ateliers in RH’s Galleries including the timing and scope of the roll out in more than 50 markets throughout the United States and Canada, the scope and presentation of the business offerings and services of RH Design Atelier, the rugs and other product merchandise in the RH Galleries and the ability of customers to work with the RH Interior Design team or a personal architect or interior designer to realize the potential of a project using the RH Design Atelier or RH Interior Design services. You can identify forward-looking statements by the fact that they do not relate strictly to historical or current facts. We cannot assure you that future developments affecting us will be those that we have anticipated. Important risks and uncertainties that could cause actual results to differ materially from our expectations include, among others, risks related to the number of new business initiatives we are undertaking; our ability to introduce new products and merchandise categories that will be of interest to our customers and to new customers; as well as those risks and uncertainties disclosed under the sections entitled “Risk Factors” and “Management’s Discussion and Analysis of Financial Condition and Results of Operations” in Restoration Hardware Holdings’ most recently filed Annual Report on Form 10-K filed with the Securities and Exchange Commission, and similar disclosures in subsequent reports filed with the SEC, which are available on our investor relations website at ir.restorationhardware.com and on the SEC website at www.sec.gov. Any forward-looking statement made by us in this press release speaks only as of the date on which we make it. We undertake no obligation to publicly update any forward-looking statement, whether as a result of new information, future developments or otherwise, except as may be required by any applicable securities laws.